Preheat oven to 400°F. 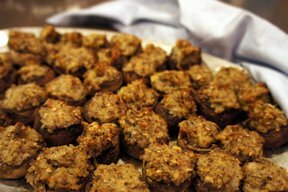 Arrange mushrooms stems side up on greased baking sheet. 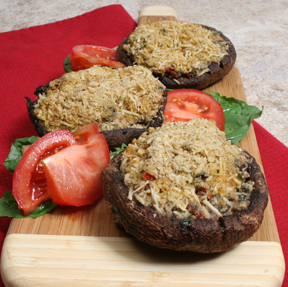 Spread 2 T. of diced tomato on top of each mushroom cap. Sauté garlic until translucent. Add zucchini and spices, and cook on medium heat for 5 minutes, or until zucchini is softened. Stir zucchini mixture with the remaining diced tomato. 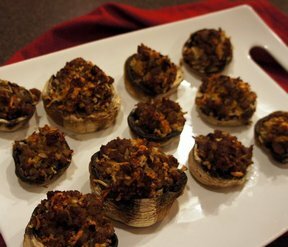 Spread zucchini tomato stuffing over the mushroom caps. You may top with grated cheese. Bake for 20-25 minutes until browned on top.